the rest of Atari’s members, things were about to get worse. Warner’s Manny Gerard said of the designers, “If they made too much money, I didn’t know how we could motivate them. Basically, they got a teeny bit of cash and debentures.” This will be important later. In the meantime, another game simply meant as a test took the world by storm. Space Invaders got off to a very rocky start. It was originally built as a hexadecimal test then converted into a game.Taito’s higher-ups weren’t too thrilled about it, but reluctantly gave the game their blessing. For the first three months after its release in June, they likely regretted doing so because it made little money. But then, its popularity suddenly exploded. By that October when Space Invaders was brought to North America it had already moved 100,000 units within Japan. As I mentioned in my very first appreciation article, the success of Space Invaders forced the Japanese government to mint thrice as many ¥100 coins to cover the shortage. What I didn’t mention was that many small business owners cleared out their stock and converted their shops to arcades filled with Space Invader cabinets. Even after such a huge domestic success Taito’s executives weren’t sure that Americans would want to play a game where a lone defender has to shoot back an alien threat. Once again, fortunately, they acted against their instincts. With Taito of America’s Keith Egging confident that it would do well, Japan’s Corporate allowed an international release and SI moved another 200,000 units. It entered the US in October of 1978, the same month as Atari’s Football, the first American game to use a trackball. Dave Stubben and Mike Albaugh fleshed out an unfinished game by Steve Bristow called X’s and O’s. Bristow saw Taito’s Soccer, which was the first game ever to use a trackball, and added it to Atari’s game. (The engineer responsible for implementing it was Jerry Liacheck, who also designed the handle for Lunar Lander and the dual joysticks for Battlezone.) Interestingly Taito was concerned about SI‘s performance in the US because most American games centered around sports, but when Taito’s SI went up against Atari’s Football it proved to be just as popular, and now most American games are shooters. sigh Curiously enough a sports game will never win an overall Game of the Year award for a number of reasons, but I digress. Despite Space Invaders‘ runaway success Football made just as much money until January ’79 when the football season ended. This was enough to pull Atari out of its year-long slump. Afterwards, Warner realized that games could be profitable beyond the Christmas season and started marketing games year-round. Of course, by then Bushnell had left the company and things were to be done differently. The home computer division was up and running, and certain designers at Atari were about to have choice words with their boss…. Bushnell was helped after his departure by not only the sudden revival of gaming, but also by a sudden anti-gaming campaign started by one Ms. Ronnie Lamb who thought that gaming was a waste of time and money and wanted to stop children from playing them. She was successful in getting several small towns to ban arcades. Bushnell knew that much of the public still associated gaming with sleazy bars and pool halls. He knew that his best bet was to create a pizza parlor that just happened to include a gigantic arcade, knowing that children would come for the pizza and stay for the games–but more importantly, they would drag their parents along. He gave out free tokens for the children so they could play while waiting for their pizza–additional tokens would cost quarters. The idea went off without a hitch and so we have never, ever had any anti-gaming controversies ever since. With the idea of arcades becoming even more mainstream than before and family-friendly to boot, gaming was sure to make a come-back. And because Atari had a 70% share of the American market it seemed that this juggernaut was unstoppable. There was so much money Atari jokingly made its own credit card. In 1978, Atari made $415 Million. In 1983, it lost $536 Million. So, exactly like a credit card, then. New CEO Ray Kassar was known as “The Czar,” which should tell you something of the dynamic twixt him and his employees. 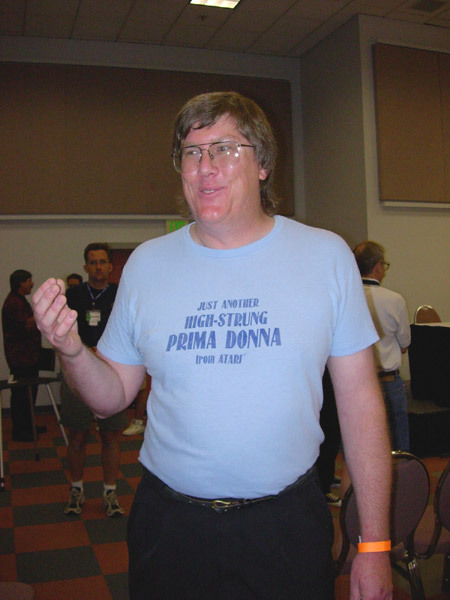 He referred to them as “high-strung prima donnas,” which they responded to by making a T shirt out of. Atari’s members were fed up with the lack of respect and understanding. Warner modeled Atari after the toy industry, in which designers did not own any of their creations. Kassar’s perception that game designers were mere grunts instead of artists only added to his long list of offenses. He had no respect for the arcade designers like Ed Logg who created hits like Gauntlet, Asteroids, and Steel Talons, but praised the home-division engineers who ported those games to the VCS. Al Alcorn and others were ready to design a third-generation console but Kassar didn’t want any product to compete with the VCS. Just ask Coca-Cola– I’ll bet they absolutely despise Sprite and Dr. Pepper for competing with Coke. (Yes, that was sarcasm.) Alcorn left after his concept for a console that featured holographic screen overlays was rejected. Once Alcorn left, no one from the original team remained. Keenan, Gil Williams, Lipkin, and others had already departed. Now Atari was a shadow of its former self. This is depressing. Here’s an uplifting picture of a kitten and a bunny. They were at a loss. What were they to do? There was no respect to be had from a company that viewed games as toys rather than works of art. Shortly after the May meeting, Kassar remarked, “I know how to handle creative people. After all, I worked with towel designers.” That October Crane and his friends left Atari to start a little company called Activision; perhaps you’ve heard of it. Next page: Activision is a runaway success! If you thought Kee Games was a danger to Atari, you ain’t seen nothin’ yet!